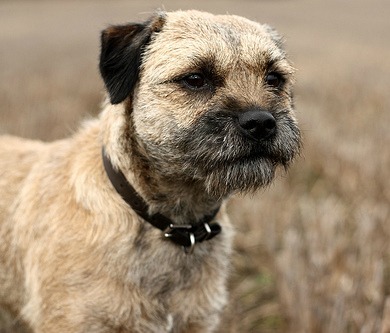 The Border terrier is often described as independent, courageous, persistent, agile and intelligent. They are friendly dogs and will greet every visitor by jumping up on them to lick and welcome them into the house. 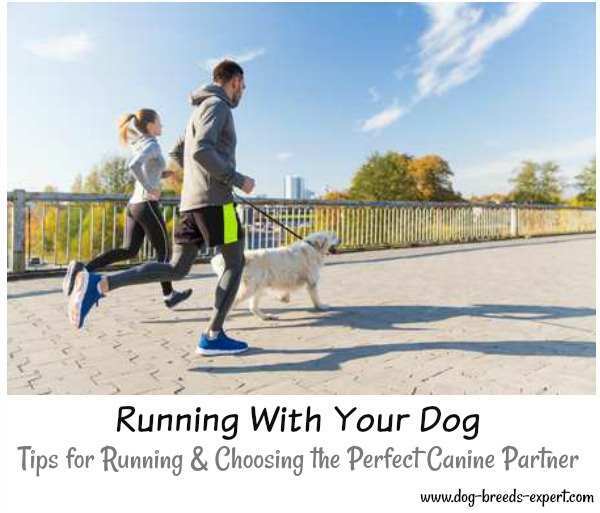 They are frequent, loud barkers and may howl and sing several times a day so are possibly not the best dog to have if you have close neighbors! 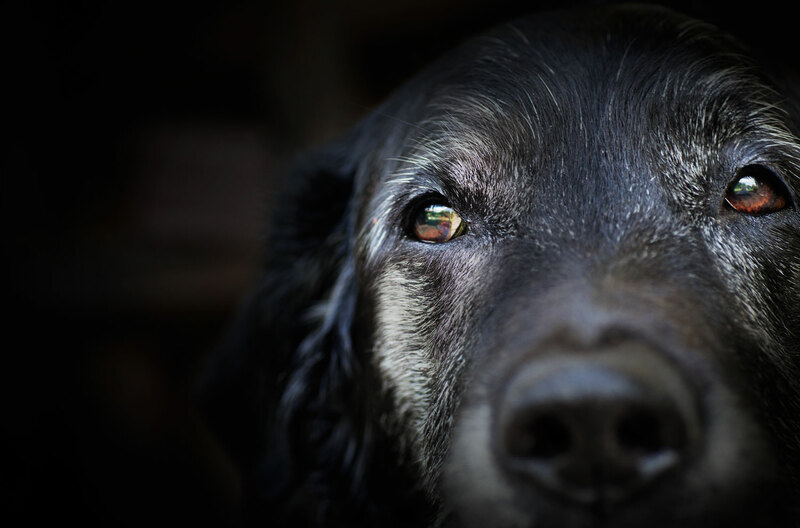 Due to the nature of them being a working dog bred to chase and kill vermin, it is advisable to keep them away from smaller pets such as rabbits, hamsters, gerbils and even cats as they do have a very strong prey drive. On the plus side though, they are extremely affectionate and work well in families where children are school age and older. They do hate to be left alone for long periods of time though and will take their frustration out via destruction of your home. 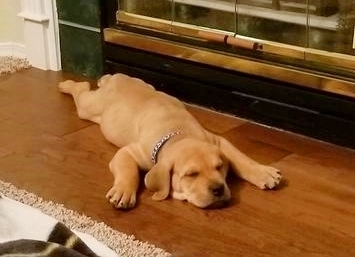 They love to chew and will chew absolutely everything including your furniture and flooring. You could try giving them long-lasting things to chew on such as the antlers opposite - they should keep them occupied for a while! They also love to dig so you may help you may find yourself with some unwelcome gardening help if they're not kept a close eye on. Make sure all fencing around your garden is secure as they may try to dig their way out for a new adventure! They have lots of energy, are very lively and need daily exercise and they are at their happiest when they have a job to do as they like to keep busy. 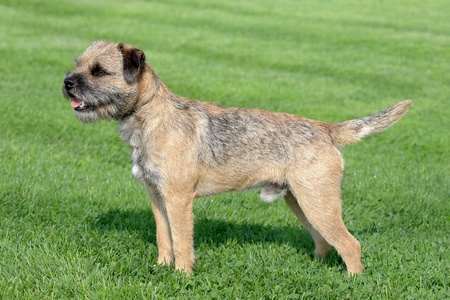 Border Terriers have been around since the 1800s and named after the Cheviot Hills area in the border between Scotland and England. They were originally bred as working dogs to control vermin such as mice and rats around farms and also to assist the hounds during fox hunts. They have great stamina along with fairly long legs for their size which is why they were the perfect dog to run at the rear of the hounds or alongside the horses on hunts. They would either run at the back of the pack or they would sit up on the horse in the saddle bags alongside the farmer. When they arrived at the scene of the fox's den they set to work. They would be told to "go to ground" and would scurry down into the den and either kill the fox or chase it out of the den for the hounds. They have large teeth for such small dogs and also have very flexible spines which help them to turn around in small spaces. These small terriers were so diligent in their work that sometimes they refused to leave the fox and could quite often spend several days underground until they had to be physically dug out. Their bark is very distinctive and could be heard underground so it was easy to locate them. dilute blue and tan (very rare), with dark ears. 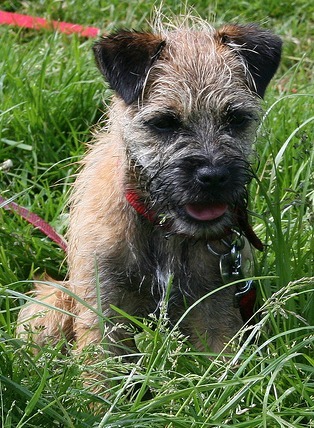 These Terriers are fairly easy to train as they are above average learners and learn new commands pretty quickly. However it will be on their terms as they have their own intelligent mind. They love to learn new tricks and to keep busy. 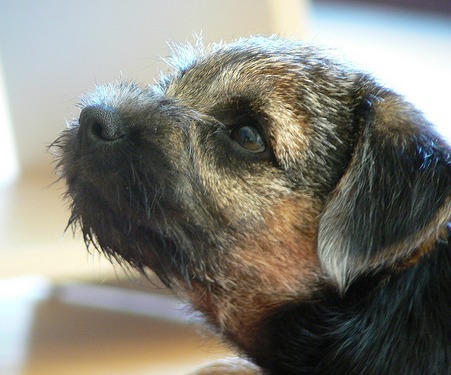 You will probably find that one of the first things you have to teach your border terrier is not to jump up on people when they first meet them. 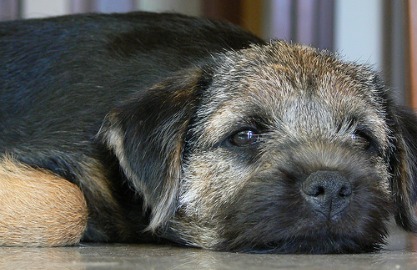 Like all dog breeds, the Border Terrier benefits from early socialization around a wide variety of people, other animals and things. This also includes introducing them to many different places. Due to the nature of a terrier suddenly running after anything which takes it's interest, they are unreliable when off a leash. So, you should be particularly careful around busy roads as they have been known to suddenly bolt after moving cars. Cars are therefore the number one killer of these small breed dogs. 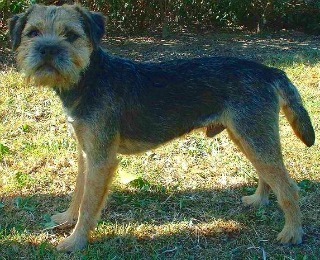 Border Terriers have extremely loud barks and are very courageous and plucky so they make great guard dogs. These dogs have short haired coats which do not suffer from seasonal shedding so you won't find much hair (if any!) in your home. However, their hair does die once a year and could break off. They should be "hand-stripped" once a year to keep the coat in great condition and fully water-proof. This small breed terrier should never be sheared as that breaks the hair which removes the water-proofing and leaves the coat and the skin open to dirt. You could find out about other Dog Breeds in the A To Z List with photos or perhaps you'd like to check out the 10 Most Popular Dog Breeds?